Hyséac K18 is a light, moisturizing and non-greasy emulsion. A Keratolytic care that promotes the uncloging of pores and limit the apearance of new blemishes, thanks to a perfectly tolerated AHA complex. Its complete formula has Licorice extract which limits the excess oils. Day after day, the pore diameter is reduced, the blemishes are diminish and the skin becomes thinner. Quick and effective action: eliminate blemishes and reduces the diameter of the pores. The complexion is softer, luminous and matified. Demonstrated effectiveness in oily, acne-prone skin. 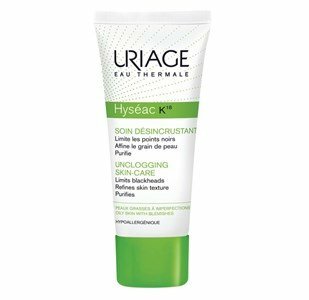 Apply one to two times a day after facial hygiene (with Hyséac Cleansing Gel or Hyséac Cleansing Water). With sun exposure, apply Hyséac Solar Fluid SPF50 + or SPF30.